Recently I was investigating some Firefox crashes that were occurring in the style system, somewhere in Rust code. These were persistent, low frequency crashes, being reported around 25 times per day. Our crash report database, crash-stats, indexes crashes by signature, which is the top one or more stack frames. From the bug report, I could see that these crashes were all in the same function, although the exact stack trace that led to calling this function varied across crashes. On a good day, looking at a crash report will reveal the bug without too much effort. For example, it’s usually easy to see when a null pointer has been dereferenced (the address being read or written will be somewhere around 0x0), and hopefully it’s obvious from looking at the surrounding code whether a null pointer should have been guarded against. On a bad day, you can spend hours working backwards from the crash, trying to work out how the program ended up where it did. These style system crashes made no sense to me. They were all crashing at different places in the function. There were all sorts of crashes – read and write access violations, illegal instructions, at all kinds of addresses. After staring at a few crash reports and the corresponding source code for some time, I decided instead to download one of the crash’s minidumps to see if it revealed anything more. Minidumps are files that contain information about the crash, including the exception, the state of all the registers, and, importantly some portions of memory from the crashing process. Much of the information in a minidump is shown on the crash report server, although privacy sensitive information is not shown. When Firefox crashes, the crash reporter will capture a minidump and submit it to crash-stats. 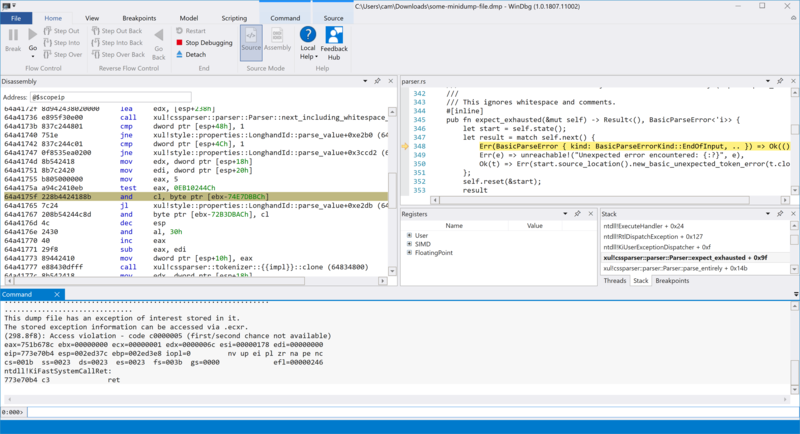 Minidumps can be loaded into Windows debuggers like Visual Studio and WinDbg. If you have correctly configured the debugger’s symbol server path, it can download debugging symbols to provide a readable stack trace. WinDbg with a minidump open. Typing .ecxr into the WinDbg command window will show information from the exception content record in the minidump. 64a4175f 228b4424188b    and     cl,byte ptr [ebx-74E7DBBCh] ds:0023:efbb2780=?? Here we can see the instruction that we crashed on, and it looks pretty odd. We’re taking ebx as a pointer, indexing it with a very large negative value, and trying to read a byte from that memory location. Given our instruction pointer is 0x64a4175f, the ebx value looks like it is somewhere within code. The indexing sends us way off, wrapping around the top of address space, where we have no memory mapped, and we crash. What’s going on? I chopped out a bunch of irrelevant output, but the interesting result from !analyze is that it discovered memory corruption, and it helpfully pointed out that it’s a single bit of corruption. It used the chkimg extension (which can be invoked by itself with !chkimg) to discover that the byte at 0x64a4175a was 0xa9 when it should have been 0x89. Warning: Any detected errors will be fixed to what we expect! That one bit of corruption made a big difference! But how is !chkimg able to find the corruption? The crash reporter includes 0x400 bytes around the crashing instruction in the minidump, which is how the debugger knows what was actually executed. Both Microsoft’s and Mozilla’s symbol servers not only store debugging symbols, but also the modules that the crashing process had loaded. Here, this includes the xul.dll module we crashed in. The !chkimg command downloads the modules from the symbol server and compares their contents to the ranges of memory that are stored in the minidump, including those 0x400 bytes. Checking a number of other crash reports with the same signature, all had memory corruption to some degree. Whether they were caused by bad RAM, bad disk, or a passing cosmic ray, I don’t know, but I was able to conclude that this bug didn’t need to be investigated further. I also learnt that before spending too much time debugging a seemingly inexplicable crash report, I should check for memory corruption first. Ideally, this kind of analysis for memory corruption would be done by the crash report processor, so that it could be shown on crash-stats. Bug 1274628 is open on this. The output isn't as rich as WinDbg’s, and notably it doesn’t do any disassembly to help you understand what the instructions were and should have been, but you can at least see there is corruption close by to the crashing instruction pointer. If you have a Windows crash report you can’t make sense of, give it a try. chkimg is available on GitHub.